A durable and reliable duty belt is essential for every active tactical professional and the N18 Lightweight Nylon Duty Belt from DeSantis delivers the strength needed to fit the bill. Constructed from two layers of military-grade nylon webbing, the belt is guaranteed to hold the weight of a fully-loaded rig without bending, sagging or coming apart. 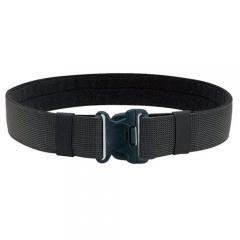 A precision-molded polymer buckle offers a secure closure that will not break or come apart. An internal Velcro® lining offers additional attachment options for hook-n-loop secured accessories. The N18 is compatible with DeSantis N19 inner belts.